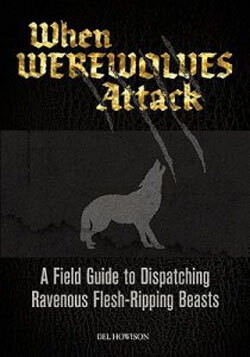 While checking out books at my local bookshop I came across a one titled When Werewolves Attack: A Guide to Dispatching Ravenous Flesh-Ripping Beasts by Del Howison, and well, I didn’t think too much of it since these werewolf “guide” books seem to come out every few months. But then I noticed that this book was in the humor section, which got my attention since that’s not usually the type of book you see among comedian biographies and LOLcat books, so of course, I gave it a quick look. THE FULL MOON IS RISING. WEREWOLVES ARE ON THE PROWL. Doesn’t sound too bad. From what I am reading in various reviews, this book simply covers super basic werewolf facts. If you’re like me and have read virtually every non-fiction werewolf book then you’re not learning anything new in When Werewolves Attack. However, it’s still a fun sounding book regardless, and one I’ll probably pick up in the future.